Last week, Nike World Headquarters hosted 166 of the nation’s top high school football prospects and I had a front row seat. I was one of the defensive line coaches brought to Beaverton, Oregon for the Final 5 Linemen Challenge at Nike Football’s The Opening Finals. That event brought me full circle as I went from Nike Football Training Camp participant in 2003 and 2004, to one of the coaches for Nike Football’s The Opening Finals. As a player, I credit the Nike camp as one of the factors that got me noticed by NCAA coaches that earned me a Division 1 scholarship. As a coach in 2016, I see the opportunities that these players are given and see why The Nike Football’s The Opening Finals is the top summer showcase event for high school recruits. Three of the biggest reasons why it is above the rest are because of the operations, the competition, and the coaching & education the student-athletes receive. Nike and Student Sports know how to run an event and run it well. They have been partnering to bring Nike Training Camps and Nike Football’s The Opening Finals for 20 years and have continuously grew it every year. When Nike puts its name on something, you know it is going to be awesome. Nike’s support brings the most technologically advanced gear to the most physically advanced high school recruits in the country. The Finals are held at Nike’s World Headquarters and the week is filled with surprises for the student-athletes in the form of multiple uniform unveilings, multiple Nike Athlete sightings, and a prime players lounge for them to relax in between meetings. The Opening Finals brings the nation’s top high school football prospects together for three days of competition. Finding the right athletes was crucial, so Nike and Student Sports hosted a 20-stop, 15-city tour and evaluated over 17,000 student-athletes. Through a formula of in-person evaluation at the Regionals and Rating Days, evaluation of the athletes’ high school tape, and projection to the collegiate level, those 166 received invitations to Nike World Headquarters. I had the opportunity to coach the defensive line that consisted of 20 student-athletes who came from different states, teams, and walks-of-life but they had one thing in common, the willingness to compete and the desire to win every rep. That joint mentality and the athleticism of each individual created for a week of constant battles in the trenches. Take 20 kids who want to win and are used to winning, then the level of everyone’s play increases. But the competition was not the biggest value the student-athletes received. The biggest differentiator from any camp I’ve worked or seen is the coaching and education aspect of Nike Football’s The Opening Finals. This year, I joined the defensive line coaching staff that included former NFL first-round draft pick, Kennard Lang, and former NFL third-round draft pick, Chuck Wiley. In addition to us three, Ndamukong Suh was a mainstay providing his expertise to the student-athletes throughout all the practices, in between reps, and during drills. The kids LOVED it. This year, Nike and Student Sports added college student-athletes to help council and educate the high school players about their position and college life. Who else gets that type of coaching and that scope of real insight from players represented at all levels? Nobody. At that moment, I realized why I was at Nike World Headquarters. Although I will not share any of the questions that were asked, or the conversations we all had, I can say that I shared the business side of sports, including my experience of having three different collegiate head football coaches. I let them know about the importance of an education by my well-documented experience of having my NFL dreams come to an end with a sudden career ending injury. The scope and depth of knowledge about the world they are stepping into increased and their level of understanding grew immensely. That understanding will be the part they carry with them for the rest of their lives and the value of that knowledge is priceless. These 166 student-athletes are in a defining time of their lives and Nike along with Student Sports provided them memories and education that will last a lifetime. It would be easy to focus solely on football, but instead, Nike and Student Sports chose to supplement it with real-life education from coaches who understand. That education is essential what sets a football showcase a part and makes it a full football experience. 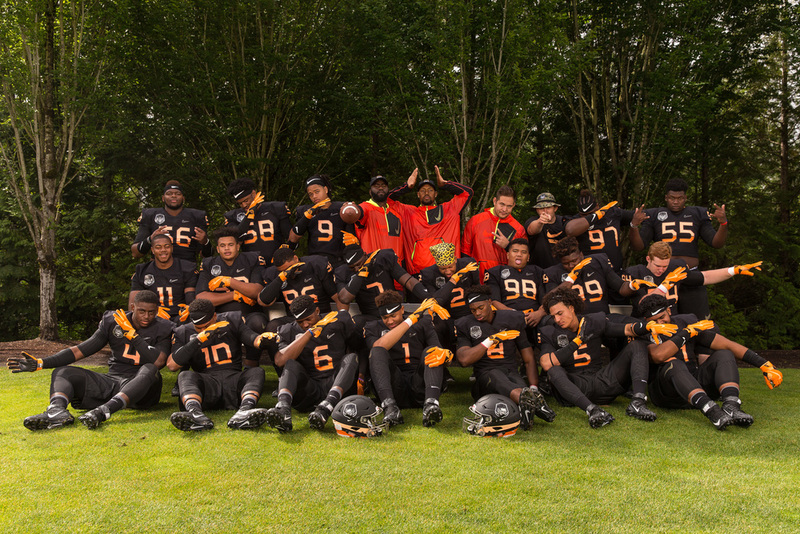 That combination of athletic and experiential education is why Nike’s The Opening Regionals and Finals is the top football showcase event in the country.